For the past several decades, wills and trusts have addressed three kinds of property, tangible property (items which one can touch and feel), real estate and liquid assets (money, accounts). With the advent of the digital age, it is increasingly important to account for a new type of property known generally as digital assets. The term digital assets is actually misleading for it refers not only to property but to the manner of storing and accessing more traditional forms of property. It can involve texts, images, information stored electronically, words, characters, codes, access to accounts and so forth. The term itself is ever changing as the pace of technology moves faster than laws can ever adapt. So the term, “digital assets” while not fully accurate is actually the best the law can do at this time. As more people are storing property in a virtual environment or creating access to property through digital means, estate planning which does not take digital assets into account is incomplete. Imagine the steady and persistent loss to an estate if the executor or family can not access accounts which were only paid on line or the deceased conducted a business on line. We are all familiar with the terms of service agreements which pop up when downloading software or signing onto an electronic platform. At the end of the agreement, you must click to “agree” or you can not move forward with downloading or entering the platform. Most users do not read all the sentences which come before “click here to agree”. Many terms of service agreements have placed road blocks before an executor or trustee’s ability to do all that the will or trust requires due to stringent privacy concerns which are indeed justified while the user is living and also for many reasons after the account user passes away. Additionally, without being given explicit permission to access accounts, an executor, trustee or family member may be in violation of federal law such as The Stored Communications Act or Computer Fraud and Abuse Act. order a service provider to disclose to the personal representative of an estate the deceased user’s records for the 18-month period prior to the date of death, but not the contents of the user’s electronic communications or stored contents. if the user has a will, that the request is not in conflict with the will. Upon demonstration of need, it is possible for the personal representative to receive permission to access records older than 18 months. Further, provided that the deceased user authorized the personal representative to access the information, the Court may authorize the provider to reveal the contents of the communications. 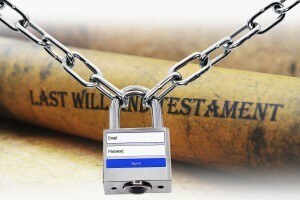 To satisfy the Court, a will should state that the executor have access to these digital assets. It can identify the accounts by name but it should not provide detailed account information and passwords. A will is a document which gets filed publically upon the death of its maker. Account details are better placed in a trust agreement which remains a private contract between the trust maker and the trustee. What is evident is that while the Privacy Expectations and Afterlife Choices Act provides some relief, it has its limits and involves the time and expense of going to Court. Seeking judicial relief is a last resort in estate administration. With proper planning there are methods to avoid the time, expense and stress. Individuals with a substantial amount of digital assets may want to consider a trust for digital assets. The maker of the trust could provide the trustee with detailed information in a private document with instructions for management and the disposition of those assets upon death. As more assets are obtained, they can be titled in the name of the trust. This also avoids the problem with licenses which expire upon the death of the user. A user may also provide access in more practical manners. First, he/she should maintain an updated inventory of digital assets. This would include liquid accounts which are accessed electronically. He/she should then keep the inventory and all passwords in a safe and secure place. Access with instructions should only be provided to the most trustworthy family member or agent named in a power of attorney document. A power of attorney document should specifically allow the named agent to access this information. The information can be sealed and provided to the executor or trustee upon death. Additionally, a user may wish to consider encrypting this information and keeping the key sealed and locked separately. User agreements should be reviewed so that a violation of these agreements does not occur if another individual is provided access. This is why having a trust be a user and a license holder may be the safest route. With the advent of the problem with providing for digital assets, a host of after life on-line service companies have been created. Some may be very good while others may be “fly by night”. Full due diligence of these companies should be provided. How long have they been in business? Who are the owners? Are there reliable user reviews and experiences? The only thing which is clear about dealing with digital assets and estate planning is that there is no clear and solid answer. As technology is changing, problems arise faster than solutions in this regard. Not taking any account for digital assets at all however, provides no solutions and leaves an estate spinning the proverbial roulette wheel hoping everything comes out alright. On that note, the last time I checked, nearly half of Americans have no will or estate plan at all including those with minor children and that, my friends, is truly reckless but I will leave that soap box for another time.